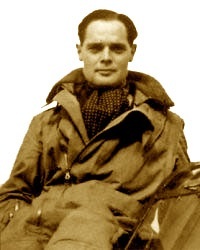 Douglas Bader was born in 1910. He was one of the heroes of England during the Second World War. He had joined Royal Air Force as a pilot. During Second World War his bravery was exemplary. He was a terror to the Germans. Once there was some problem in the aircraft. Captain Bader had to crash land. During this mishap both his legs were amputated. But didn’t loose heart. He got artificial legs surgically attached to his body and did severe practice to fly again with artificial legs. He appeared before the board of Royal Air Force and got the approval of flying again. He again became terror to the Germans . His plane was shot by the Germans, Captain Bader bailed out with parachute without artificial legs. He has described in his own words as follows: - “I then realized that my appearance was a bit odd. My right leg was no longer with me. The leather belt which attached it to my body had broken under the strain, and the leg, SPIT FIRE, and I had partied company”. He was caught by the Germans and made a prisoner of war. During confinement he again got his artificial legs attached. He attempted to escape from German prison on his artificial legs. He was caught again and his artificial legs were removed. After Germany was defeated in Second World War, Captain Bader was released from the German prison. He was the lead pilot in the flying past during the victory parade in London. After retiring from Royal Air Force, Captain Bader worked for Petroleum Company . He became a legend during his life time. “Don’t listen to any one who tells you that you can’t do this or that. That’s nonsense, make up your mind, you never use crutches or sticks, then have a go for everything”. “Never, never make them persuade you that things are too difficult or impossible”. Captain Bader died in 1982.